I use to imagine wild adventures and exotic trips to far off lands like they were fantastical, only possible in a dreamland. But why do things need to be so out of reach? A Namibian safari is the number one item listed on bucket lists around the world yet it remains there like something unattainable. Only if…. Well, I understand. It kept showing up on my list too but this year, this week, today, I was able to make it happen. I’m in Namibia on a Namibian safari thanks to Namibia Tourism and ATI Holidays. 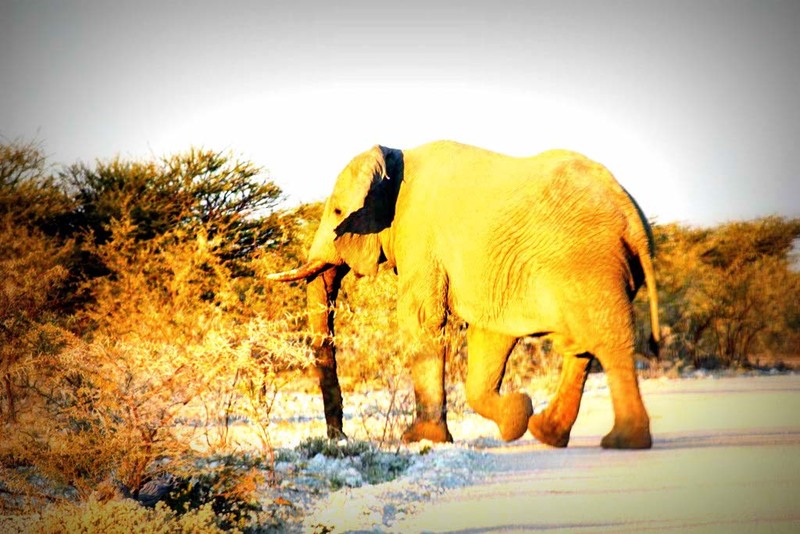 For the last three days, I explored Etosha National Park on a self-drive Namibian safari. After years of dreaming, imagining, and envisioning a Namibian safari, I still wasn’t prepared for what was to come. Endless herds of wild animals crossed the dirt road as if I was part of the group. Animals that I’ve never seen outside of cages roamed free and showed their true colors in their natural habitat. Around every turn and behind every bush, something was alive. I was alive, and awake, and actually part of it. Every emotion bubbled to the surface like a boiling pot. This was Africa! This was real, but this was my dream! We first entered the park in the late afternoon. There was only an hour to explore but the animals were out and posing for the camera. As soon as we entered the gate, a massive black rhino was waiting for us. I snapped picture after picture, not believing my eyes. It didn’t seem real. It was within 20 feet. I became acutely aware of my setting, put down the camera, and took it all in. No matter how long I live, I will always remember those first few moments. Not only was a looking at a rare black rhino, but anything could happen. I was in the wild. When a huge elephant appeared to my right, I was dumbfounded. I kept saying, “I can’t believe he’s right there.” I wanted, not more than my life, to open to door and walk over to that magnificent creature. It was all so real yet so surreal at the same time. He moved gracefully through he’s natural environment and grabbed a mouthful of leaves as he walked. I wanted him to approach the car. It felt like I could will it, but wild animals have a mind of their own. There was no controlling that guy; he was free. We only had time to stop at one water hole that evening but we saw other elephant, dozens of springbok and impala, several zebras, and two jackals. Respecting the park’s time restrictions, we had to call it an evening. The sun was setting as we drove away and an elephant roamed in the tall, distant grass. Every day continued to get better and better, but you’ll have to wait for one day at a time. There’s just too much to tell!